Today’s dental implants do more than just restore your smile. They also promote better oral health. If you have missing teeth, the remaining teeth must work overtime to properly chew food. This issue is quite common. By about age 40, roughly two-thirds of Americans have lost at least one permanent tooth. By about age 70, which is basically late middle age, about a fourth of American adults have lost all their permanent teeth. If you are missing one or more teeth, or have chipped or damaged teeth, read on to see what you can do about it. Unlike dentures and some other procedures, replacing damaged teeth with dental implants is basically a surgical procedure. 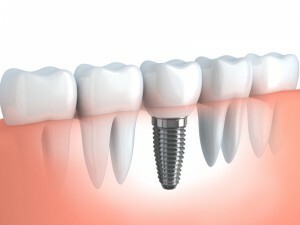 As a result, the cost of dental implants can be a substantial investment. In fact, in most surveys, most patients express a great deal of satisfaction with every aspect of this process, except the cost. The crown, which is the visible part of the implant ($1,500 to $3,000). These cost estimates include the price of materials, the cost of the surgery, and any associated expenses. No two procedures are alike, which is why there is so much potential variation. Bone mass in the jaw is a good example. Once a tooth falls out, the jawbone immediately begins contracting. So, to support the titanium post, Dr. Stone must often graft bone cells from another part of the body to the mouth. Amount of work is another example. Ironically, it is easier to replace a missing tooth than a damaged one. In dental implant cases, Dr. Stone must remove any remaining parts of the tooth. So, we often recommend crowns or something else less invasive in these situations. Are Mini Implants Cheaper Than Full Implants? In a word, yes. As the name implies, thin screws, instead of titanium posts, support mini implants. The less-invasive procedure, as well as the need for less bone mass, reduces the cost significantly. There is a tradeoff. Mini-implants are so new that there is not as much longevity data. But minis may not last as long, especially if the patient is a teeth-grinder or has other poor oral health habits. Still, in the right situation, mini-implants are an outstanding option. Today’s prosthodontic patients have so many choices. The only way to find out which one is right for you is to schedule an appointment with Dr. John Stone at Best Dental Associates. Without expert guidance, you might well spend years wondering about what might have been.